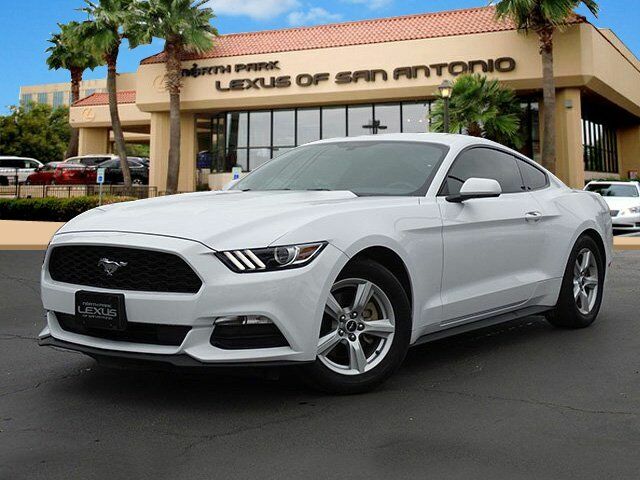 CARFAX 1-Owner, LOW MILES - 28,638! Onboard Communications System, CD Player, Keyless Start, HID headlights, Smart Device Integration, ENGINE: 3.7L TI-VCT V6, SPARE WHEEL & TIRE, Alloy Wheels, iPod/MP3 Input, Back-Up Camera AND MORE! Back-Up Camera, iPod/MP3 Input, CD Player, Onboard Communications System, Aluminum Wheels, Keyless Start, Smart Device Integration, HID headlights MP3 Player, Keyless Entry, Steering Wheel Controls, Electronic Stability Control, Bucket Seats. SPARE WHEEL & TIRE, ENGINE: 3.7L TI-VCT V6 (STD). Ford V6 with Oxford White exterior and Ebony interior features a V6 Cylinder Engine with 300 HP at 6500 RPM*. Brake Assist, 4-Wheel ABS, Tire Pressure Monitoring System, 4-Wheel Disc Brakes Edmunds.com explains "Regardless of trim level, the Mustang's interior materials are high-quality. Drivers of almost all sizes will easily find a suitable driving position, thanks in part to a standard telescoping steering wheel. ".